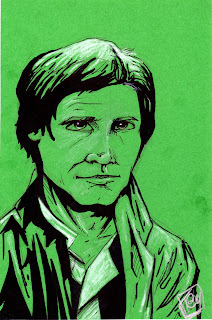 I have wondered for a while why I had not done a pin-up of Han Solo until recently. I'm not sure why. Han Solo is one of the coolest characters in the Star Wars universe! No seriously! So here he is, Han Solo in his Endor Jacket! I chose to do this version of Han Solo for the color of the card stock. This was a commission for a young lady by the name of Candace. She bought my 3PO(yellow cardstock), R2(blue cardstock), and Chewie(brown cardstock). To not have a repeating color within the four pieces, I chose the green and played off of his camo jacket that he wore while the rebels are on the forest moon of Endor. I think he turned out great! Out of all of the vintage Kenner Han Solo action figures, I think I like this Trench Coat version the best! It's a toss up between this version and the Hoth version Han Solo action figure. Action Figure of the Day has some pretty convincing reasons on why the Trench Coat version of Han might be the best. I never owned a Han Solo action figure from the old Kenner line. I'd like to change that one day, but we'll see. By the way, did you know that the Chewbacca action figure can also wear Han Solo's Endor trench coat? I was going through my friend, Jeff's, vintage collection, when I found Chewie wearing Han's Jacket. I'm not sure why he was in it, but he looks good in it. You can also see this art piece here.